Everyone wants to know how to save strokes in golf. Of course, the easiest way is to hit a hole in one like Ernie Els at the Travellers Championship at the TPC River Highlands, Cromwell, Connecticut, on the weekend. But, unfortunately his feat is extremely rare! There are, however, other ways to save strokes on the course; just ask Jim Furyk who shot a 58 on the final day! We all hit errant shots while playing golf. Some end up in the woods, the pond or in the dreaded sand trap. My friend Geary has a solid game, but hates playing out of the sand! Who can blame him right? During the same round with Geary, I hit my 8-iron short into the sand trap on the 14th hole. I am not sure why, but my shot ballooned and landed in the sand. As you can see, my next shot was from an embedded lie. An embedded lie in the sand trap. More importantly, notice all the rake and foot print marks around my ball! I appreciate everyone looking after the golf course! Playing an embedded lie or in other cases any lie in a sand trap is difficult. I have discussed the three main aspects of great sand play in an earlier post. I focused on bending your knees, following through along your target line, and hitting behind the ball. I realized after many years of struggle out of the sand, that these three components are critical to a successful sand shot. 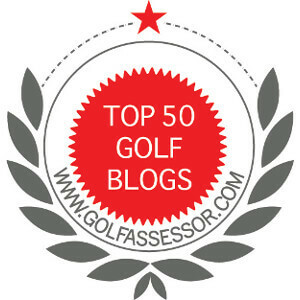 Understanding them will definitely save you strokes on the golf course. My current predicament has my embedded ball 5-feet below the level of the green. My ball was situated about 15 yards from the pin and I have to carry the ball at least 8 yards to land on the fringe. Tough lip to get over from an embedded golf ball! As I set up for this shot, I ensured that my knees were bent and that my foundation was set. I needed very little lower body movement on this shot. To increase my stability, I set my feet up for the shot, then twisted them back and forth a bit so my soft spikes bit into the sand more than normal. For this shot, I had to add another component to make sure of success. I steepened my swing angle towards the ball. Instead of a normal swing, I made my swing look like a V. This steeper angle helped me pick the embedded ball out of the sand more effectively. It was as if I dropped my club behind the ball and quickly picked it to make sure I had a high follow through. This steeper swing plane is critical to make sure my club head went below the ball to allow the bounce of my club to pop the ball out of the hole with enough force to travel the distance I needed to make this shot. Hitting behind the ball and following through on my target line helped with this successful golf shot. 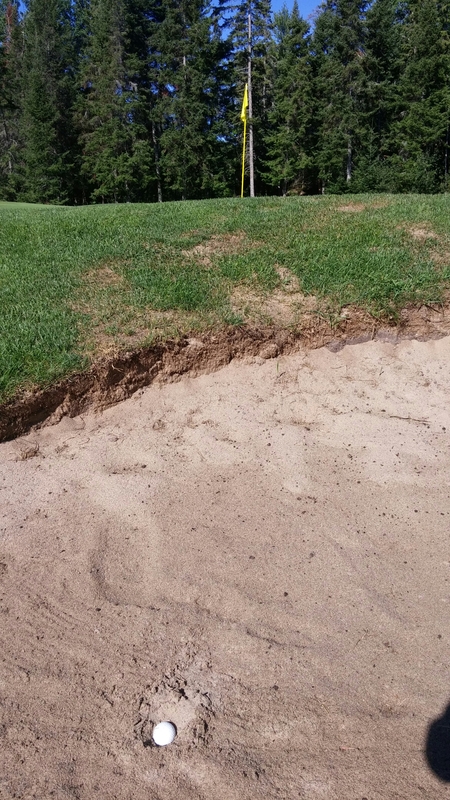 As you can see in the above picture, my club entered the sand very sharply about 1 inch behind the ball. My follow through was short as I picked my club up to my high finish. You can see that the divot is smaller than normal and is in line with my ball flight. As a result of combining bent knees, a high follow through, hitting behind the ball and a steep (V shaped) swing plane, I was able to hit my ball 4 feet from the pin! I was very happy with my success because shots like these help save strokes and lower my golf score. Understanding how to play an embedded ball out of the sand is very important to consistent golf. This type of shot (and other recovery shots) happens infrequently when playing and proper execution of such shots lets you record a par instead of double bogey on the scorecard. 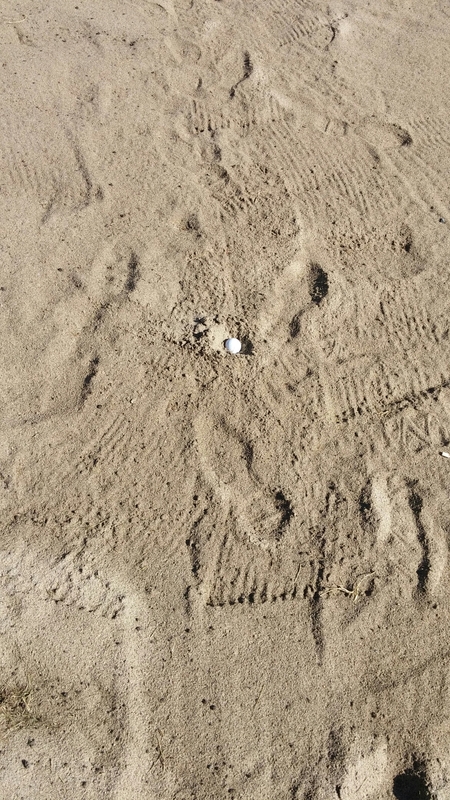 Do you have other tips when playing an embedded ball out of the sand? We are all listening. I use the toe down method with my 60 degree lob wedge. I find it very effective by hitting behind the ball and letting the sand push the ball out. I learned this from a video by Johnny Miller years ago. Comes in handy here in Florida. I am not sure I am familiar with the toe down method. I will have to look that up. Thanks. You guys know so much more about this than I do. But I do find that my shots from greenside bunkers work out better if I stare at the divot until I hear the ball land. Keeping your head still is always key to making any shot. I will give your tip a key and let you know how it goes. Thanks. Jim, you might have caught a better lie in that guy’s unraked footprint! I know. That is a big problem at our course. It seems many people think that they do not have to rake their marks. How is it at your course? These lies aren’t uncommon out at our course, and your advice for getting out is sound! I don’t try and get too greedy with these shots, and just try and get back to safety. Sometimes conceding that bogey will be a good score is the best way to take double bogey or worse out of play. Thanks. You are right sometimes it is. Important to take your medicine to avoid a big number. My lie is rare for our traps, but I need to stay sharp to keep my scores low!